My boys LOVE to play outside. As a mom I am very happy about that. I know that the majority of kids today do not get outside and get the daily physical activity they need. The Centers for Disease Control has issued a statement explaining how important it is that children have at least 60 minutes of physical activity each day for healthy physical, mental and social development. Crayola is on a create-and-play mission with Olympic Gold Medalist Dan O’Brien to inspire families to get outside and exercise their bodies and imaginations with creative Crayola activities. Empowering a child to create everything imaginable this summer is fun and affordable with the newest lineup of Crayola Outdoor art tools. After a hop, skip, and many jumps, Olympic Gold Medalist Dan O'Brien set a new Guinness World Record for fastest game of hopscotch to kick off National Physical Fitness & Sports Month and to raise awareness of the value of outdoor creative play. "Helping Crayola inspire families to get outside and get creative is what this record is all about," said O'Brien. "I took the Outdoor Challenge because I care about kids and I want to see them lead healthy and happy lives." With a time of 1 minute 21 seconds, Dan broke the previous record by nearly 2 seconds and added another achievement to his many athletic feats. Join Crayola and Dan O’Brien in helping us reach our goal of 1 million hours of creative outdoor playtime. Take the Crayola Outdoor Challenge Pledge HERE and commit to the number of hours you’ll spend outside playing and creating with your kids this summer! Color Explosion -Crayola Color Explosion lets you create swirls of surprising colors with one clear marker! Color Explosion Extreme Surprises provides an added twist - radical color patterns that are different on every page! Bet you can't wait to see what's next! 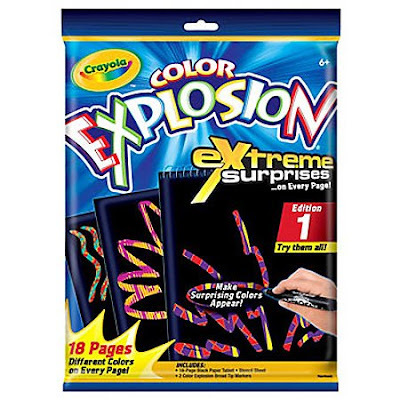 Color Surge- Color Surge lets kids do what they never could before create bright colors on dark colored paper. Use the special markers and paper to see just how many bright ideas you can create! 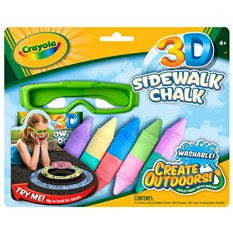 Giant 3D Sidewalk Chalk -Watch your child's imagination run wild in new and amazing ways! 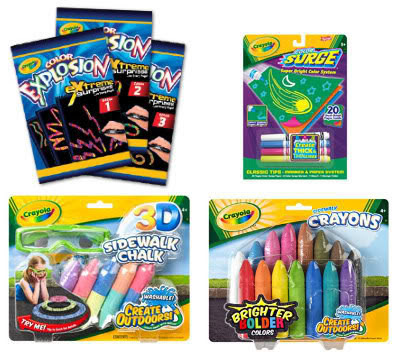 With the 3-D Giant Chalk Set from Crayola, the creative possibilities are limitless! With four giant dual-colored sticks of chalk, a how-to book filled with cool ideas and two fun pairs of durable plastic 3-D glasses, your child wil l have a blast drawing images and watching them spring to life! Crayola Sidewalk Crayons. Create with brilliant colors outside! Crayons work in all sidewalk chalk tools. The Scribble and Sing Art Station looks like it would be fun for Miss Pea. You are linked up on my blogroll! I know my son would like the coloring book with the cars and trucks. I also like the TaDoodles first marks. My son would love these. We are huge fans of Color Wonder at our house! I really love the Scribble and Sing Art Station. That is really cute! Thank you! I favor the Color Wonder Magic Light Brush. I just because a fan at Facebook. The glow station looks fun! The glow station looks neat. Thanks~! Our family loves model magic. We love the all the different crafts we can make with it. I'd love to try the Glow Station. I like the Color Wonder Magic Light Brush!!! The 3-D chalk is so cool, too!! Following you on twitter and I tweeted this giveaway! My girls are drooling over the Crayola Cutter, with all the different model, hair styles,clothes. I like the Rainbow rake! my cousin would love the TaDoodles First Marks! I like the Scribble and Sing Art Station. Thanks for the great giveaway! I like the color Explosion 3D. The window crayons are such a great idea! The kids always want to decorate the windows for holidays and this gives them a canvas that will be very washable. Crayola modeling clay for my choice. Their colored pencils always catch my eye. The Color Explosion Glow Board looks neat. I think the Tadoodles first marks looks fun. Thanks for the chance. The 3-D Sidewalk Chalk looks like a lot of fun. I've heard really good things about it! I love the Color Wonder markers. 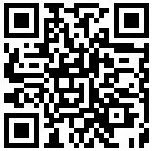 I have your button on my sidebar. I would love to try the True to Life™ Crayons! My son would love to have the Sidewalk Paint Sprayer. He points it out everytime he sees it at the store. The 18 ct. Washable Paint Pots with Brush would be perfect for my daughter. My kids love the PipSqueaks markers. They are just perfect for their little hands. The crayola glow station looks really neat!! I like the crayola beginnings triangle crayons! I love the 120 count crayon packs. My son's two favorite things are coloring and being outside, so he would love the bright colored sidewalk chalk! The Crayola Glitter Glue is always fun--it adds some dazzle to our projects. I like the scribble and sing art station. I'd love to get my kids the Model Magic Fusion! Fun! I love all Crayola products...but I especially love the Crayons. 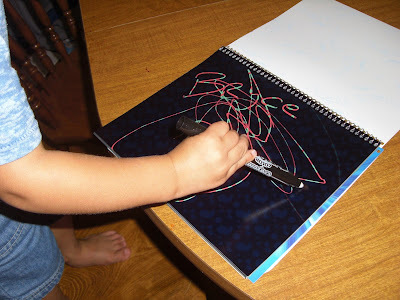 Pip-Squeaks Colored Pencils would be a big hit in my house! The Window Crayons. I really want to try them. They look like so much fun. Got the Life In A House Of Blue button on my blog. I really want to try the window crayons. 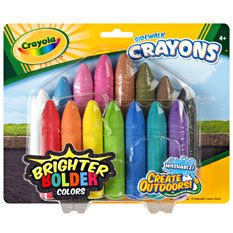 All of Crayola's products are great!!! I know my kids would love the Crayola Glow Station™! I really like the Window Crayons. Thanks. The color surge markers look like something my kids would like to use. The Glow Station looks really fun@! Thanks for the chance! I like Crayola Doodling Fine Line Washable Markers. The Sidewalk Stencils-Little Mermaid caught my eye. I follow your blog (jenbutterfly12).